You often see a garden statue of him with a bird on his shoulder. Yes, St. Francis of Assisi did have a special relationship with animals. He preached to the birds, pacified a wolf, and put together an animal cast for what is widely regarded as the very first live nativity scene. Instead, he was in love with creation. And that’s because he was in love with the Creator, who he regarded not as some cosmic force or distant, detached monarch, but as “Father.” He so loved God his Father that he had great affection for anything related to God – the sacraments, the Church, its very imperfect ministers, broken down country chapels, and all of God’s marvelous works of art – human beings first and foremost, but also the animals and even the inanimate objects that adorn the heavens and the earth. Now, this does not mean that Francis saw all creatures as his equals, as some modern day animal rights advocates seem to. One animal rights philosopher, Peter Singer, goes so far as to teach that adult whales and chimpanzees are actually superior to unborn, newly born, and retarded humans in both dignity and value. He would save the whales allow both abortion and infanticide. St. Francis would be appalled by such a concept. Biblical person that he was, he understood that woman and man are God’s supreme masterpieces, made in His image and likeness, unlike the animals. Human beings are given dominion over the rest of creation in Genesis 2 not to exploit however, but to cultivate, care for, and perfect. God entrusts Adam and Eve not with “the environment,” but with “the Garden” – a place of beauty in which we are made to walk with God. 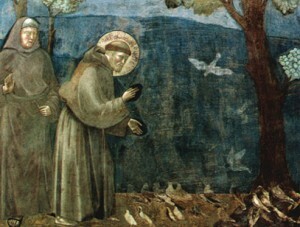 So St. Francis loves the birds, but also presses them into the service of the gospel. He saves the wolf of Gubbio from the wrath of angry townspeople, but rebukes it for its ferocity and calls men and wolf to live everafter in harmony. And the animals of the nativity scene? They are companions of the infant who is the Word made flesh. So the authentic biblical and Catholic approach to “The Environment” is not to see it coldly and scientifically. Rather, in the fashion of St. Francis, Catholics should approach it as the expression of the Father’s beauty, as the gift of the Father’s love, as an icon, a window to the new creation. Reckless exploitation would never fit with such a vision. But neither would some secular environmentalism. post and your quote is very apt. for the integrity of creation. is, but I presume most here would condemn a secular outlook.